The stunning, outrageous assault upon our fellow Americans continues. Republican Representative John Bennett held an interim study on “Radical Islam, Shariah Law, the Muslim Brotherhood and the radicalization process” in order to offer information that may form the basis of legislation he is considering drafting for the next legislative session. One can imagine what kinds of laws this kind of lawmaker would propose. The meaning of the word “patriot” has been so badly skewed that red flags go up in my mind whenever I hear it these days. The meaning of the word “Christian” has been similarly misused. As a Christian minister, I cringe whenever public figures use that name in ways completely inconsistent with the Christ whose name we wear. That’s why I was gratified to read the response of an Oklahoma Baptist minister taking Rep. Bennett to task. Pastor Mitch Randall’s article is worth reading in its entirety. As an American, I am appalled at this line of false inquiry and inquisition…. It doesn’t surprise me in the least to learn that Rep. Bennett is running for re-election. This kind of alarmist rhetoric used to stir up emotions and get out the vote; manipulating fear mongering is popular these days. America has enough real enemies; we don’t need to waste our energy conjuring up imaginary ones, especially by turning fellow Americans and friends into invented enemies. Besides Pastor Randall, it is gratifying to know that quite a few of my fellow clergy colleagues continue to protest these dangerous politicians’ dangerous positions. And it is nice to read Bennett’s Facebook page to see the irate responses of many Oklahoma voters. 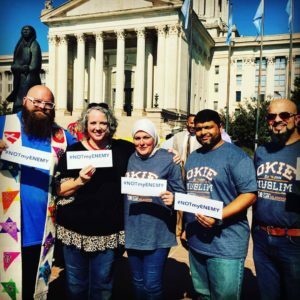 And it is good to hear that several of Bennett’s fellow Oklahoma Republicans have publicly called out his Islamophobia in the past. 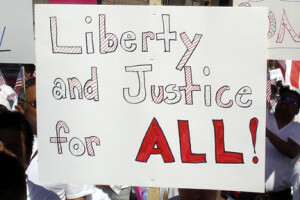 Our combined voice speaking up in protest and speaking out for justice will not be silenced. This represents the America I know and love. This variegated, versatile variety of people is what makes America great. This is the America which stirs and deserves my patriotism. 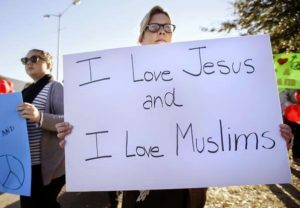 Charlotte’s minister friend, Pastor Courtney, protesting and networking with her religious friends in Oklahoma. Wonderful essay — couldn’t agree more! !